Engineering specialists at Michigan State University have developed the first stretchable integrated circuit which totally utilizes an inkjet printer. This stretchable electronic material recreates the expenses of adaptable hardware similar to the expenses of printing daily papers. 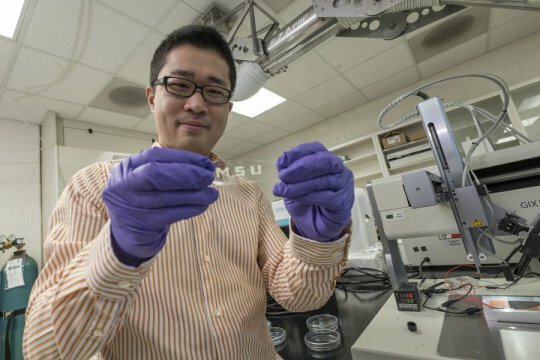 Chuan Wang, assistant professor of engineering at Michigan State University, developed an ultrathin electronic material that can be stretchable to desired length. "We can conceivably make the costs of producing flexible electronics comparable to the costs of printing newspapers," said Wang. "Our work could soon lead to printed displays that can easily be stretched to larger sizes, as well as wearable electronics and soft robotics applications. "The fabric is composed of nanomaterials and organic components which are mixed to generate various electronic inks. Wang’s team effectively produced this flexible material, the circuit and the organic light-emitting diode, or OLED in his lab. The next process includes the combination of the circuit and OLED into a single pixel, which it will take up to two years. The fabric can be readily produced by profit-oriented once the circuit and OLED have effectively produced into a working pixel. Possibly, Wang stated, the stretchable electronic texture can be collapsed and put in one's pocket without breaking. "We have created a new technology that is not yet available," Wang said. "And we have taken it one big step beyond the flexible screens that are about to become commercially available. "Want to know more about this awesome device? Follow this Link!